We moved our Big Girl to the Big Apple. A brief visit to New York City has left me with plenty to write about, but at the top of my mind right now is our precious elder daughter, a fully grown young woman who is off to make her way in the big, big city. It feels very much like we drove her to the edge of the precipice, looked down a steep cliff into the water below, and pushed her off with an admonishment to sink or swim. Of course that’s not the case. This was a planned journey and one she’s had her eye on for several months. But even our preparedness doesn’t block the emotional toll of packing our young adult daughter off to what amounts to a foreign land, even though it’s just a car day’s drive away. When she came home from doing her Master’s Degree in London, we did not know that she would be home for nearly a year. The first few months were a little rocky as she struggled to get her footing and as we all worked to get used to living together again. But that was short-lived. Eventually she found some work and we worked out the kinks. We always knew it was a temporary arrangement and that she would move on. About three months ago she made the announcement that she would be moving to New York City at the end of the summer. She didn’t have a job there, yet, but she was making a plan. She worked two jobs all summer long to save up a little nest egg. She will be telecommuting to her part-time marketing job from home, while also doing an internship for a marketing firm in lower Manhattan that specializes in the music industry. 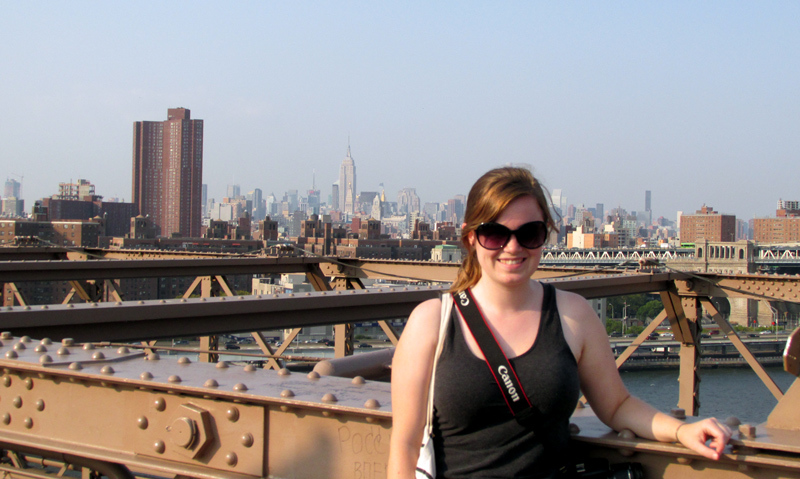 Here’s our New York City girl atop the Brooklyn Bridge with the Manhattan skyline in the background. It is an understatement to say that there is a tremendous culture shift between our quiet, rural region in Western New York and the gritty, noisy, teeming streets of New York City. Perhaps that’s the hardest part for me. When she went to London we simply put her on a plane and cried our goodbyes. This time, we packed quite a bit of her stuff, including some small pieces of furniture, into our car and drove almost 400 miles to help her get settled and actually see where she will be living. Sometimes, unseen is easier to take. New York can very easily feel overwhelming. Surrounded by people, you can feel lost in the sea of humanity. She was feeling a little of that as she showed us around on our first full day. By the end of the second day, she was already talking about connecting with some people she knows and making some plans. My darling daughter: SWIM! But before you start, take just a moment to enjoy the plummet off that cliff. Let the exhilaration engulf you and breathe in the fullness of the moment and witness the plethora of opportunity ahead. When you hit the water, take just a second to feel the refreshment in hitting something brand new. Then stretch every muscle, and swim. Enjoy the work, the view, the grind that builds character and emotion and brain power. Remember to come up for air once in a while and give yourself a chance to simply breathe. Open your eyes, your heart, your mind, and your arms. Take in all of the atmosphere and knowledge you can. Build all the friendships you can. Good things do not come to those who wait; they come to those who work hard to get them. I would love to tell you that I found a flowery quote to go along with this, but really what keeps running through my head right now are the words to the classic rock tune by Bachman-Turner Overdrive, “Baby, you ain’t seen nothin’ yet.” So much of life is stretched out ahead of you. Go ahead and grab it! And while you are swimming, remember that no one is more worried about you and confident in you all at the same time; no one believes in you more; and no one loves you more than your parents. Create the self you want to be. Congratulations on taking the plunge. Now SWIM! Here I am turning 55. Just how on God’s green earth did I get this old? I have a close friend of over four decades who calls this birthday “55 Alive.” You see, her father never made it to that age, so for her family, turning 55 is a reason to both celebrate and reflect. I am borrowing that philosophy today. There may come a point in each of our lives when we look critically at who we are and what we have accomplished, and realize that we have more years behind us than we have ahead. In these moments I pause to wonder, what remains to be done? It is then that I start looking for good examples. Finding and being a good example is something my mother used to dwell on. When we were children she wanted us older kids to set good examples for the younger ones. We hated that at the time. Now as I look for good examples, I also look AT my mother. At 84 years young, she has raised five children, outlived her husband of more than 40 years, and lives life very much on her own terms. In her senior years she has been active in numerous community groups and clubs, built her own at-home sewing business, learned to play the piano, and keeps busy attending cultural events and spending time with friends. 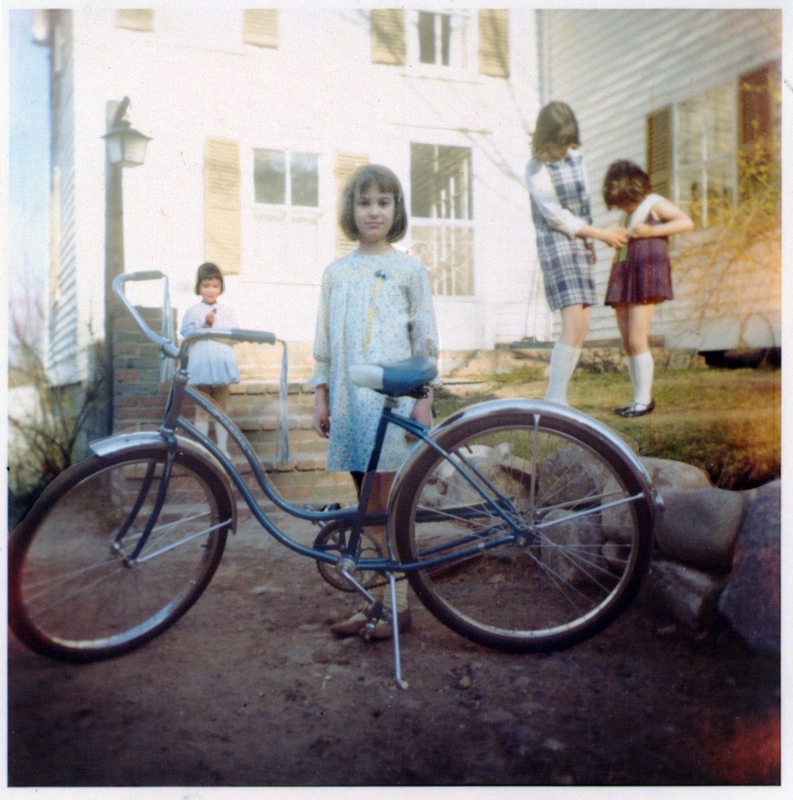 My 9th birthday, with the Schwinn I got from my great aunt. When I was a teenager, I condemned so much of what I felt my mother stood for. There she was, tied to a home and family, giving up her “self” for the sake of others. That, I swore, would never be me. In the 1970’s women were burning bras and rallying against a male-dominated society, and those were the women I admired. But life has ways of redirecting us and now I, too, have raised my family and am shuffling my cards again. In many ways I will never be my mother. Her faith is strong. She is incredibly organized. She is more calm and collected than I will ever be. Despite our differences, I have grown to deeply respect her and she is a great example. So as I move on in my own journey, I have reviewed my own priorities and found that I have already been somewhat successful. My daughters are pursuing their own lives, my husband and I are finding our way back to our own relationship without children, and my career paths and volunteer work have, I think, made a positive contribution to my community and fulfilled my own sense of self. What’s left? For starters, I am working to be healthier, so that I can enjoy this next stretch of my life with some degree of physical comfort. I will always have this stupid disease/condition called Achalasia to deal with, but I refuse to be either defined or debilitated by it. Creative pursuits are more of a priority than ever: writing especially. And the time I spend with family and friends is precious. If you make it to this point in your life without scars then you have taken no risks. The scars: physical, emotional, or psychological, make us stronger. These battle wounds are the result of loss, illness, fear, and unrealized ambitions. Life is scary and messy and almost never goes our way, so I will wear my scars with pride at having navigated the chaos so far. I have also been blessed to be surrounded by interesting people. I have family and friends who are caring, thinking, and committed. They are engaged in the world around them, in other people, in nature, and in projects that improve not only their lives but the lives of others. When I was young, I wanted to change the world. Guess what? The world has changed during the course of my life; some of it for the better, some for the worse, and hardly any of it because of anything that I did or didn’t do. I am rarely content to simply be content. Now, as I move past this double nickel birthday, I hope to use whatever time I have left to find just a small sliver of contentment as I still work to fill my time with purposeful pursuits. There are many, many working years remaining before retirement is even an option. Despite that, I am going to make time to enjoy this beautiful earth around me and the fabulous range of people who inhabit it. Maybe it is no coincidence that the “double nickel” is standard highway driving speed – 55mph. Care to join me for a birthday cruise?